It squeezed my heart to hear Elizabeth Gilbert’s recent news. 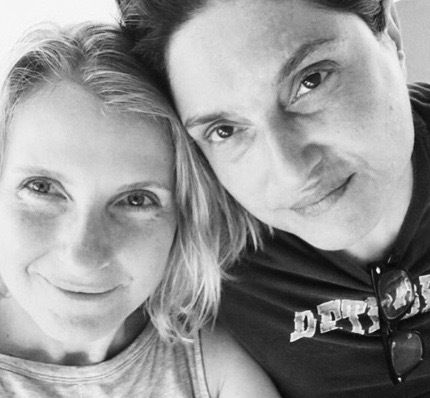 In case you missed it, the Eat, Pray, Love author Liz Gilbert announced recently on her Facebook page that after learning of her best friend of 15 years, Rayya Elias’s, liver and pancreatic cancer, she realized she was the love of her life and there was nowhere she would rather be than at her side. Here’s how she put it..
“Death — or the prospect of death — has a way of clearing away everything that is not real, and in that space of stark and utter realness, I was faced with this truth: I do not merely love Rayya; I am in love with Rayya. And I have no more time for denying that truth. I’ve come to think that illness arrives in our lives as a way to light up the core of our souls. We get to discover what we should have known all along, especially when it comes to love. Laura and I might have taken 10 years or longer to move in together, if it hadn’t been for her illness. In fact we might never have gotten round to it, worrying over whose apartment to pick, or if we needed more room, even if we could trust each other with our finances. But the first glimmer of news that she was seriously ill and I knew instantly in my heart that we would move in together, we would pool everything and be together come what may. I hope that Liz and Rayya are blessed with enough time to truly enjoy their love for each other. The alchemy of being with a soulmate who is sick is that your love becomes finer and stronger and reaches for that extraordinary pinnacle of unconditional love. Also you are forced to live in the present in a way that nothing else can achieve. The future and past become irrelevant, there is nothing that matters, except the now. I am praying for a happy ending, knitting my best blanket of love and wishing them God speed. Dear Lucie, your words really touched me, not only because I do love Liz Gilbert and all you had said about love, but because I had witness this love transformation as I recently had said goodbye to a dearest cousin of mine. What I witness in her family, since we knew about her sickness and for the short time she was in the hospital, was pure love all around. This was a family that would never show any sign of affection, they would be together but you would never see them hugging each other, or touching each others hands, or a kindness in their look. It looked all very cold. When my cousin got ill and her illness increased I witness all the gestures of tenderness, care, love, warmth, and tireless attention to her and between them. It was lovely to see them together and giving each other the opportunity of feeling, giving and receiving love. It really touched deeply my heart to see how they had transformed their moments with her until she felt ready to leave. To say goodbye for the ones we love is never easy, it is sad and painful, but I felt something beautiful in her departure, I felt she left when she felt release, as she herself could feel and witness the love in her family. In the end does not really matter how long we love but that we loved, even if is just for a instant.